I love the look of beautifully set holiday tables. You know the ones, the ones with the lovely matching holiday china, gleaming polished silver, perfectly pressed linens and sparkling stemware. The serving platters would be filled with superbly cooked food... tender and juicy meats, warm crusty breads, and roasted vegetables on the side. Sparkling wines would glimmer in my sparkling stemware, and a sideboard would hold all of my beautifully decorated desserts. 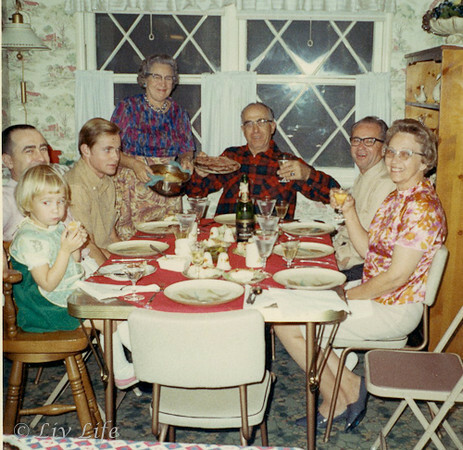 Reality, though, sometimes throws a wrench onto my perfectly set holiday table. China and silver do not line my shelves, my linens sometimes have wrinkles, and occasionally the stemware has a spot or two that gets wiped away at the last minute. Holidays for us are occasionally celebrated on alternative days to suit my airline pilot husband's traveling schedule, and on occasion I've overcooked the meat. What I've come to realize over the years though, is that none of that matters. It's not the table that makes the holiday, it's the people. And I'm so thankful to have been blessed with a multitude of friends and family over the years who have made our holidays extraordinarily special. From just next door to up the coast to across the country, our table has been graced with smiling faces I will never forget. This month's Inspired Plate Challenge held the title "The Holiday Table", and I truly enjoyed the opportunity to try to shoot my actual table, albeit during that completely mad moment just between getting the turkey out of the oven and the vegetables in. As mom and Liv worked to get our gravy put together, my husband carved our bird, and my dad filled the water glasses. Stealing a few moments, my aunt and I worked together to shoot our holiday table 2012. The shot at the top of our post gives you a glimpse of our setting only minutes before the turkey arrived. Liv and I enjoy putting our table together, and over the years we've come up with a few easy tips to make the holiday table festive and fun. A tablecloth always adds a touch of elegance. Bring in the outside... our centerpiece is a grouping of Giant Sequoia pine cones (don't tell anyone we picked up a few on our last visit... the sign said that was not allowed!) set among a few candles. Or how about a few fall colored leaves or a sprig of holly? Keep the centerpieces fairly low, and not too large. Something as simple as a bowl full of glass Christmas Tree balls will bring an additional festiveness to the table (Use different colors for different holidays). Chargers under the plates bring a sense of something special. 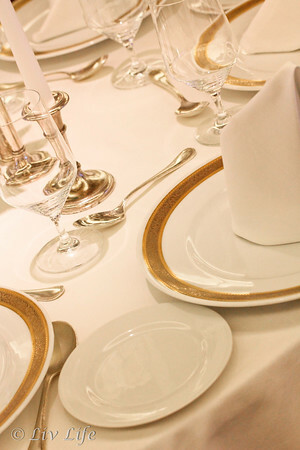 Cloth napkins along with napkin rings always spruce up a table. Don't have formal rings? It's a perfect project for the kids to make! Name cards also add a special touch... how about a card pinned to a little pumpkin for decoration? 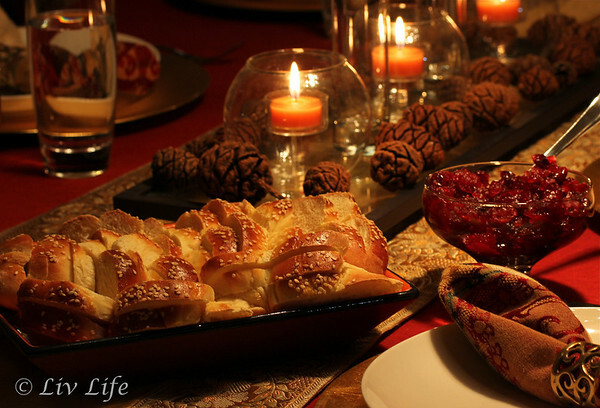 Decorate with food... for example, place a candle in a hurricane and fill halfway with cranberries or un-popped popcorn. Fill a bowl with fruit - clementines, pomegranates and a few fresh cranberries along with a few citrus leaves if available. Make a peppermint stick vase. Serve homemade or store bought desserts layered on a simple platter. The ideas are endless! One can decorate without needing to invest a great amount of money, and with just a few special touches your table can be festive and bright. 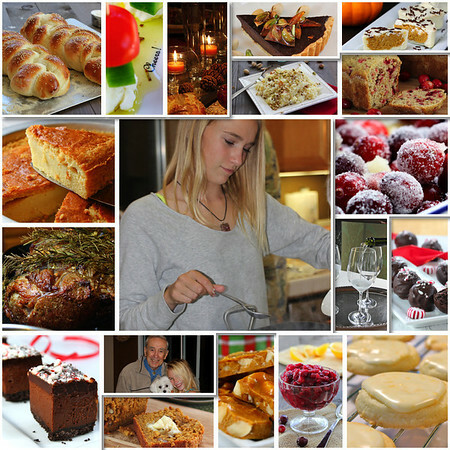 For more fabulous holiday table shots, follow our Inspired Plate (we have a Facebook Page!) Clog circle, next up we head across the country to my friend and fellow TIP member, Tiffany Dahle of Peanut Blossom. I love both the photography and the sentiment. I hope it was a great holiday! Beautiful table and philosophy alike! Beautiful photos, and I love your advice! The photo of you as a little girl is the best!! You already know what I think about that table setting. It fills me with warm fuzzies and makes me want to join you for dinner. Gorgeous. Your table looks awesome! I totally wish I'd been able to grab some images of our Thanksgiving because I was super proud of it so I'm totally jealous that you managed to get an awesome one! Love the pinecones and candles in glass jars :) It is really hard to balance candlelight against ambient and you were under a serious time crunch because you shot it at a real dinner!